It brings a sparkle to the eye. Racing is fun, competition is exciting, but The Trail is the jewel. I've known a few ride managers over the years that have gone to extremes to put together a special trail, or series of trails - Jackie Bumgardner, Barbara McRary Crocket Dumas, Dave Nicholson, Randy Eiland, Sarah Metcalf - Jose Manuel Soto, Luiz Enrique Opazo - I know there are more, but these people stand out in my personal experience. 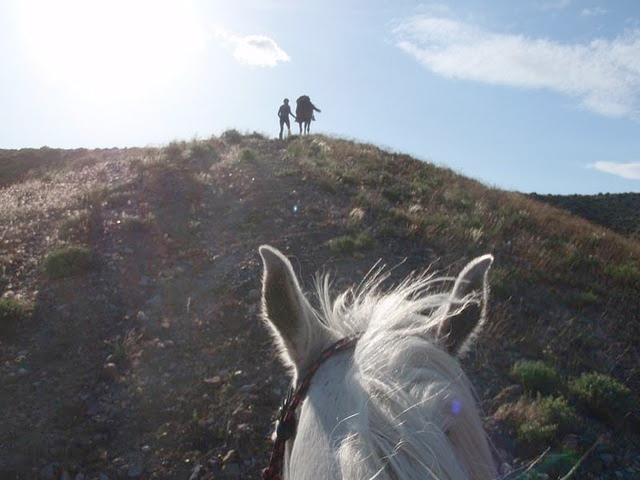 And there are some amazing trails such as Bighorn and Tevis and Old Dominion and Florac and Shazada and Al Andalus, Torres del Paine, ... huge efforts, big ambition, totally driven by The Trail. 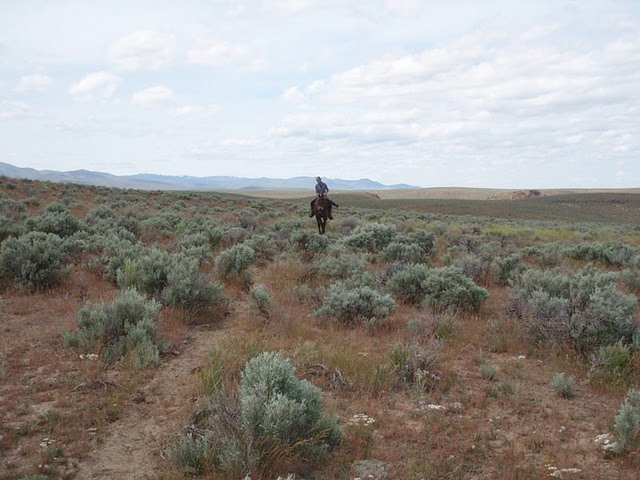 I guess I'm pretty driven by The Trail too, here in my own Owyhee back yard (though I've dreamed of putting together rides in other places, and still may!). If we could just go there... and there... and maybe even there! There's so much variety here - the river, the canyons, the creeks, the mountains, the ranges... putting everything together for a ride is something I just totally enjoy. 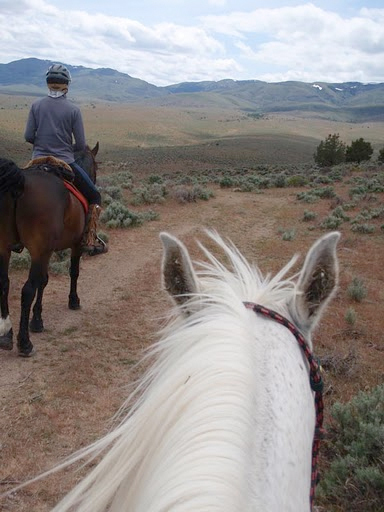 And the ride, The Trail, gives me a reason to get out and explore, and mark trail (a chance to slow down and really see the trail), and play with maps and Google Earth. All that really fun stuff. Carrie Thorburn and I marked the Whiskey Traverse earlier today. It was wet, it was cold, and it was windy. We were getting chilled by the time we reached the fence west of the petroglyph field. We didn't want to spend the time to trim the brush so we just pushed on through on our way back. I was worried about hypothermia because of the wet and cold. The trail is lightly marked west from the fence through the boulders until the talus slope chokes the path down. The path is very well marked through the rocky talus section. The trail is lightly marked again from the rocky stretch to the bridge. Even with the light marking, I used nearly a hundred clothes pins. I wanted to do some trimming but we were just getting too cold. Depending on the weather tomorrow, I may go back for the spring pruning. Really, there shouldn't be any problems on the trail -- just keep the river on the right and the cliffs on the left, and reverse the directions on the way back. Put a long-sleeve shirt in the Sierra del Rio vet bag and enjoy the ride. 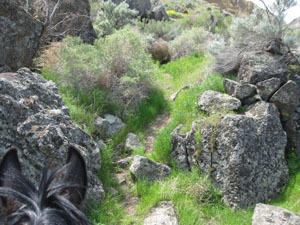 The stones were wet but both horses worked their way through the rocky section with no problems. 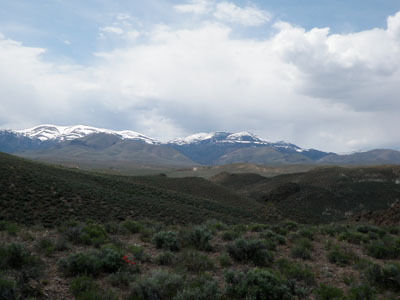 I think it will be a great trail for the 80- and 100-mile riders. The river was quiet and slate grey today and the banks were a vivid green. We saw a dozen or more white pelicans on the water below Con Shea road. Even though we were wet and cold, it was a beautiful day and no one else was out on the trail today. Now I have a fire in the wood stove and will soon begin chopping vegetables for dinner.